What should a good cycle track look like? 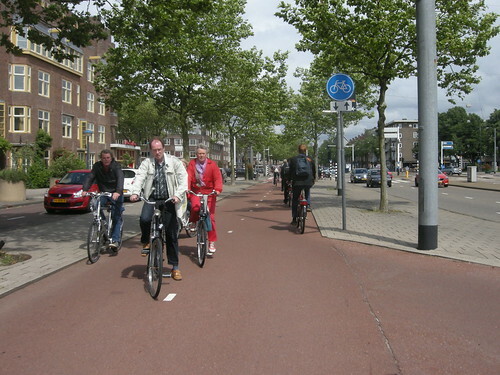 Cycle tracks should be wide - the wider the better. At the very least, they should be wide enough for cyclists to pass each other comfortably. This is particularly important given that cycle tracks should be inclusive, and allow easy use by cargo bikes, handtrikes and mobility scooters, without impeding others. Dutch guidelines recommend a minimum width of 2m for a uni-directional track with for usage levels up to 150 cyclists per hour; greater usage levels require wider tracks. Cycle tracks should have a smooth and flat tarmac surface, of a colour that distinguishes it from the adjoining footway (pavement), or road. The kerbs beside the track should be of a low height, and angled, if possible. Not only does this reduce the risk of accidents, it also maximises the effective width of the track. With low kerbing, it is possible to cycle right on the edge of the track, allowing others to pass easily. High kerbs, by contrast, force cyclists to ride in the middle of the track, greatly reducing the available width. A cycle track should be direct, and not switch from one side of the street to the other. They should form a straight route from A to B, and not pass circuitously around impediments or objects. Cycle tracks should pass behind bus stops. This means that buses and cyclists are free from interactions with one another; the bus does not have to overtake cyclists between stops, and cyclists do not have to navigate out around buses at stops. This can often be achieved by using existing bus lay-bys as a new waiting area, with the cycle track passing behind it. The bus then waits in the road. There are good examples in the UK, for instance in Brighton. Cycle tracks should have clear, continuous priority across side roads, just like the main road they run alongside. The design of the junction should reflect this priority, with turning traffic yielding to traffic continuining straight ahead. 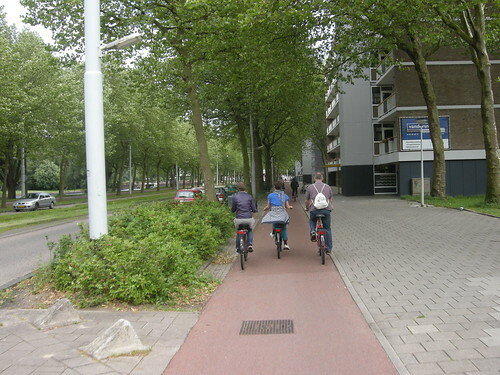 The footway (pavement) should be continuous across the side road, along with the cycle track. The geometry should be tight, to prevent motor vehicles turning across the track and pavement at speed. The track and footway should also continue at the same height, with motor vehicles having to drive up over a ramp to gain entry to the side road. Conflict can be mitigated further by setting the track back from the junction mouth, providing a waiting area for motor vehicles both entering and leaving the side road, and also by limiting the use of side roads to local access only, minimising the number of potential interactions. At major junctions, cyclists should be free from interactions with motor vehicles, by separation either in space or time. Signal phases should be designed to prevent cyclists continuing straight ahead from coming into conflict with turning traffic. Cyclists should not be expected to make UK right turns from the middle of multiple traffic lanes. Safe passage should involve a direct and convenient two-stage turn, separated from pedestrian provision, or a simultaneous green signal for bikes ('scramble crossing').